Linguistics is the study of the capacity to use language. This includes phonetics and phonology (how sounds are produced and received), morphology (how words are built from smaller elements), syntax (how words are combined to form sentences), and semantics and pragmatics. The Linguistics BA focuses on these aspects, while the Experimental Linguistics BSc focuses, additionally, on the experimental methodologies for studying them. One or more subjects from English Language, Mathematics or science preferred. Experimental Linguistics pathway: at least one subject from Biology, Chemistry, Mathematics, Physics and Psychology. 36. Experimental Linguistics BSc pathway: 36. A score of 17 points in three higher level subjects preferably to include English Language, Mathematics or a science subject, with no score lower than 5. Experimental Linguistics pathway: A score of 17 points in three higher level subjects including one from Biology, Chemistry, Physics, Mathematics or Psychology with no score below 5. A score of 15 points in three higher level subjects preferably to include English Language, Mathematics or a science subject, with no score lower than 5. Experimental Linguistics pathway: A score of 15 points in three higher level subjects including one from Biology, Chemistry, Physics, Mathematics or Psychology with no score below 5. BTEC Level 3 Extended Diploma (QCF) or BTEC Level 3 National Extended Diploma (RQF - teaching from 2016) with Distinction, Distinction, Distinction. Experimental Linguistics pathway: BTEC is not acceptable for entrance to this pathway. Pass in Access to HE Diploma, with 18 credits awarded with Distinction in the Level 3 units, the remainder of the Level 3 units awarded with Merit. Experimental Linguistics pathway: Access to HE Diploma is not acceptable for entrance to this pathway. D3,D3,M1 in three Cambridge Pre-U Principal Subjects, preferrably including English Language, Science or Mathematics. 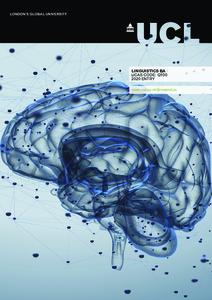 Experimental Linguistics pathway: D3,D3,M1 in three Cambridge Pre-U Principal Subjects including one of Biology, Chemistry, Physics, Mathematics or Psychology. AAB at Advanced Highers (or AA at Advanced Higher and BBB at Higher), preferrably including English Language, Science or Mathematics at Advanced Higher. Experimental Linguistics pathway: AAB at Advanced Higher (or AA at Advanced Higher and BBB at Higher) including one from Biology, Chemistry, Physics, Mathematics or Psychology at Advanced Higher. Successful completion of the WBQ Advanced Skills Challenge Certificate plus 2 GCE A-Levels at grades AAB. One or more subjects from English Language, Mathematics or science preferred. Experimental Linguistics pathway: at least one subject from Biology, Chemistry, Mathematics, Physics and Psychology. You will gain broad-based training in linguistics together with the opportunity to explore other themes such as language acquisition and language processing. UCL is known worldwide for its teaching and research in linguistics and the work of our staff appears in internationally acclaimed journals and books. Our focus on small-group teaching helps develop a friendly and supportive atmosphere. LingSoc, the linguistics student society, runs a mentoring scheme whereby second-year or final-year students support new students. You will have access to extensive computer facilities and to a specialised on-site library in addition to the UCL Main Library. In each year of your degree you will take a number of individual modules, normally valued at 15 or 30 credits and adding up to 120 credits per year in the European Credit Transfer System (ECTS). Modules are assessed in the academic year in which they are taken. The balance of compulsory and optional modules varies from programme to programme and year to year. In the first year your modules are all compulsory, providing a foundation in linguistics and helping you assess where your own interests and strengths lie. In the Linguistics BA pathway you will take an additional module covering the acquisition of language by children while the Experimental Linguistics BSc pathway replaces this with a module in experimental methods. In year two, Linguistics BA students take at least four intermediate modules covering the core areas of semantics and pragmatics, phonetics or phonology, and syntax. They will also take a further 30 credits of modules from any area of linguistics, and up to 30 credits of university-wide electives. Experimental Linguistics BSc students take at least three intermediate modules from the core areas of semantics and pragmatics, phonetics and phonology, and syntax. They will also take modules on statistical methods, language acquistion, psycholinguistics, and neurolinguistics, as well as one 15 credit elective module. In their final year, students on both pathways undertake a research project, involving a deep and sustained study of a subject in which they are especially interested. Students on the Linguistics BA pathway take three advanced modules from the core areas of linguistics and one further intermediate or advanced module offered in any area of linguistics. Experimental Linguistics BSc students take one advanced module in a core area of linguistics, one further linguistics module of their choice, one laboratory-based module, and one experimental module. The elective modules you take in years two and three may include modules offered outside Linguistics, for example, many students choose to take language courses taught by the UCL Centre for Languages & International Education. BA Linguistics students will study Semantics, Pragmatics, Syntax, and either Phonetics or Phonology at intermediate level amounting to 60 credits. BSc Experimental Linguistics students will study 60 credits of modules in Research Design, Child Language Development, Psycholinguistics, and Neurolinguistics. Linguistics BA students select 30 credits of further linguistics modules, and 30 credits of elective modules from across UCL. Experimental Linguistics BSc students select 45 credits of intermediate modules across the areas of syntax, semantics, pragmatics, phonetics, and phonology, as well as 15 credits of elective modules from across UCL. Students on both BA Linguistics and BSc Experimental Linguistics complete the Long Essay/Project, worth 30 credits. Linguistics BA students select 45 credits of advanced modules in Syntax, Semantics, Pragmatics, Phonetics, and Phonology, and 15 credits of advanced or intermediate modules in linguistics not already taken. Experimental Linguistics BSc students take one practical laboratory-based module, and one experimental module totalling 30 credits. In addition, they select 15 credits of advanced modules in Syntax, Semantics, Pragmatics, Phonetics, and Phonology, and 15 credits of advanced or intermediate modules in linguistics not already taken. All students select 30 credits of further intermediate or advanced modules in linguistics, or any intermediate or advanced modules available at UCL. Teaching is mainly delivered through lectures, workshops and small-group teaching (tutorials in which you meet with a group of between five and 12 students and a staff member to discuss topics covered in the lecture) as well as a virtual learning environment. Some modules also involve workshops. Each module is assessed and examined separately, often by a combination of essays, exercises and examinations. Your performance in a module is always assessed in the same academic year in which you take it. Detailed course descriptions are available on the department website: Linguistics BA. In addition to subject-specific skills, you will also acquire the analytical, investigative and study skills essential for most graduate careers, which could include law, computing, commerce and industry. Recent national surveys show that Linguistics graduates have above average employment rates and starting salaries after graduation. Many Linguistics graduates from UCL carry on with the subject at graduate level often with a view to pursuing an academic career. Linguistics connects with many other disciplines and a number of graduates go on to work in these areas, e.g. teaching languages, especially English as a first or foreign language, speech therapy, advertising or the media. We are looking for students with strong analytical skills who are fascinated by languages and intrigued by how the human mind works. We place particular emphasis on your personal statement and will be looking for clarity of expression and evidence that you have considered the subject in detail. If you live outside the UK we may contact you by email or telephone to ensure that both we and you are able to make an informed choice about your application. We value the experience that candidates who do not have standard qualifications may bring, and encourage you to contact us if you are interested in the programme.